I am smoothie person who love to throw a few ingredients in blender and make delicious drinks. Yes I make smoothie very often. Nowadays I skip adding any added sugar to smoothie. 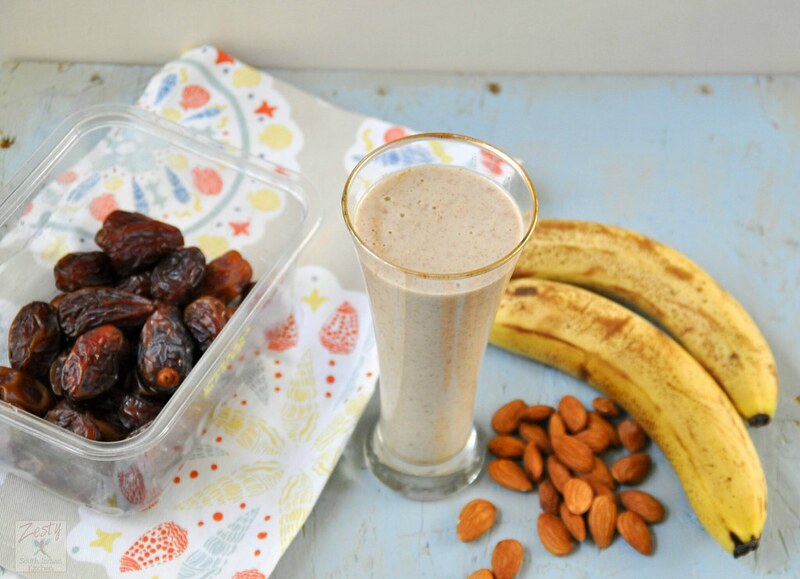 Yesterday I made this coconut date almond chia smoothie, as I need to finish some bananas. Yes I added bananas also. Result was absolutely scrumptious. You can finish the entire glass in one sitting. I am a coconut fan; yes love it in all form whether it is coconut oil or coconut milk, maybe because I was born and brought in part of India where coconut is abundant. Without coconut we don’t know to make curries. Also coconut is not used in teaspoon or tablespoon; we used it in cup or even a whole coconut for a single dish. This recipe is inspired from Sasha Seymour’s Coconut Everyday book. I borrowed this book from the library. It has lot of coconut recipes. I would love try few recipes from this book, and of course with my own twist. I won’t say this is a sugar free smoothie. Yes I added dates. Dates are sweetest fruit with high in natural sugars like glucose, fructose, and sucrose. But eating them in moderation is okay. For making this smoothie, first grab pitted 3 dates; I used Medjool dates, and then added whole almonds, if you have almond butter use that. I read that eating stuffed dates with almonds and walnuts is healthy snacking idea. Then add coconut milk, water, ½ banana, chia seed and cinnamon. I did not add any ice as I used thawed coconut milk, if you want you can do that. This is absolute vegan treat even you can make ice cream from this one or even a morning oatmeal, options are endless. 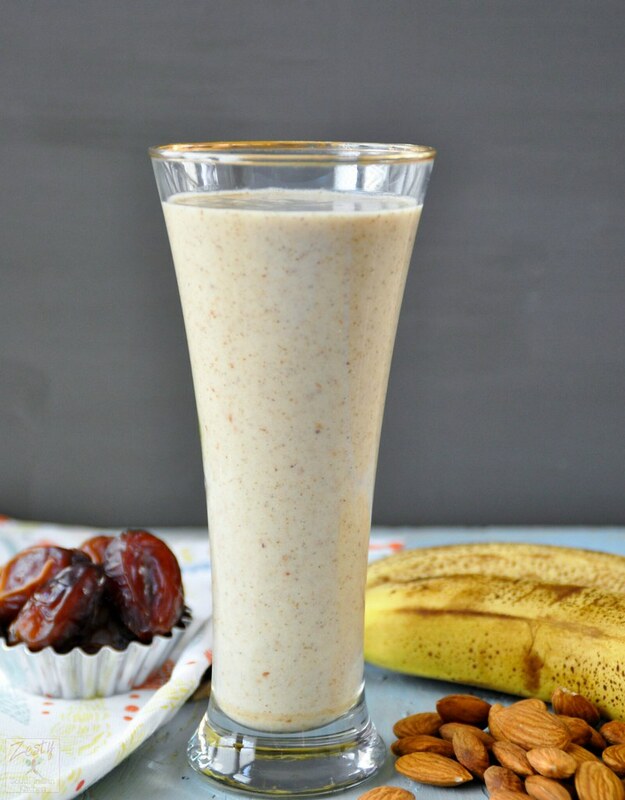 This smoothie is thick and rich also taste like almond joy/payasam (Indian sweet pudding). I love it. 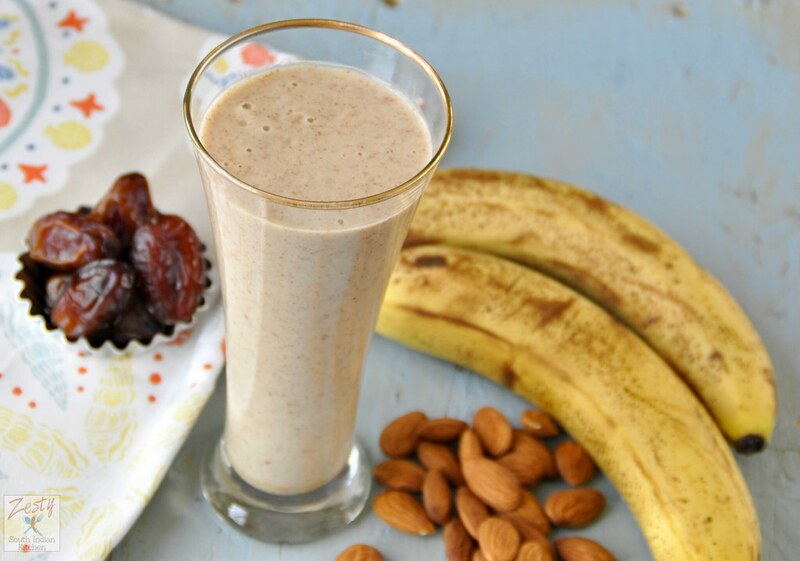 If you make a date with this smoothie you won’t be disappointed. It is absolutely delicious! 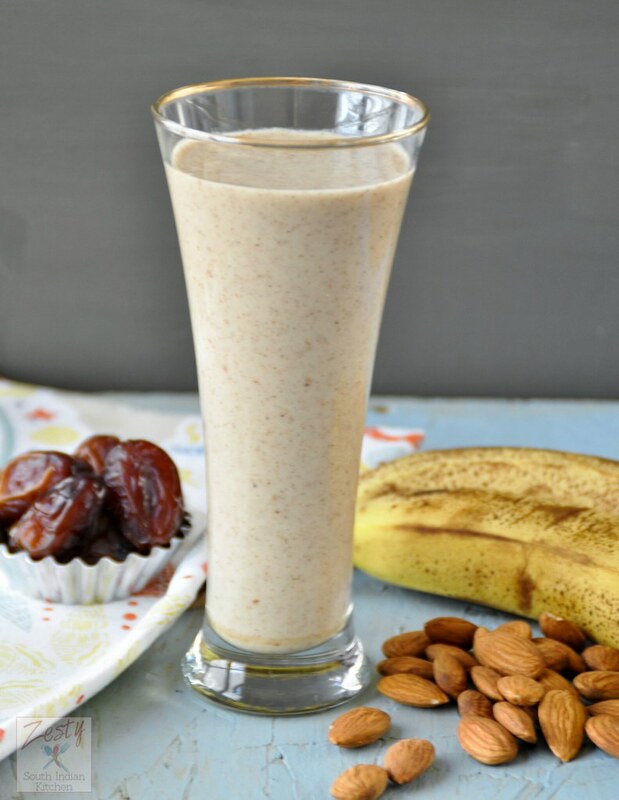 Delicious Coconut date almond chia smoothie without any added sugar. In a blender add all the ingredients and blend it into fine consistency. I didn’t add any ice as I used thawed coconut milk. If you want you can use ice. I am tempted by this smoothie… just sounds too tempting! So healthy and delicious smoothi Swathi..
Oh yes, this will definitely make a great breakfast for me when on a sugar free diet.. so filling and healthy.. and delicious too! Wow! I am drooling!! Simple ingredients, awesome flavours and full of good health too! Loving it.